eSwatini is home to the Bushfire Festival, a three day music-focused event that attracts people from all over. This past weekend, the 12th edition of the festival happened. There were thoughtful conversations around warm fires. There were high energy performances that made me remove my sweat-soaked shirt. The Bushfire Festival invites participants to bring their fire as a call to action. Artists from all over the world perform on four different stages. The live music selection included rap, soul, country, instrumental and traditional. The photo above features Sands, a native son of the kingdom, serenading us with his soulful music. There was also an amazing array of DJs that kept the party going until the early morning hours. Personally, I was elated to see my favorite DJ in eSwatini, DJ Mkay. Another cool thing about the festival was the plethora of PCVs who visited from other southern Africa posts. It’s nice to meet and chat with people who are having similar, yet vastly different, experiences. It was also great to promote Beards of Peace Corps and take new photos for the project. Around August 2017, I was trying to decide how I was going to bring in the new year. At first, I was pretty set on going to the Vic Falls Fest at Victoria Falls. In case you don’t know, it’s a multi-day music festival. When I started looking at logistics and pricing, I decided that it wasn’t for me. Back to the drawing board. I decided that I wanted three things. Amazing, delicious food; beautiful beaches; and a country that I hadn’t been to before. Some folks suggested that I check out Zanzibar in Tanzania. I did, and decided that I wanted to ring in 2018 there. My initial plans were foiled by an Airbnb snafu, but I resolved that and ended up staying on a different part of the island (Pajé) than I initially intended (Nungwi). It was pretty great. Many days were spent reading and resting on the beach. I was able to finish Kevin Hart’s book. I was able to eat several delectable delights. I met some friendly PCVs currently serving in Zambia. The new year was celebrated at a party on the beach complete with fireworks. If you ever have the chance, I’d highly recommend getting to Zanzibar. 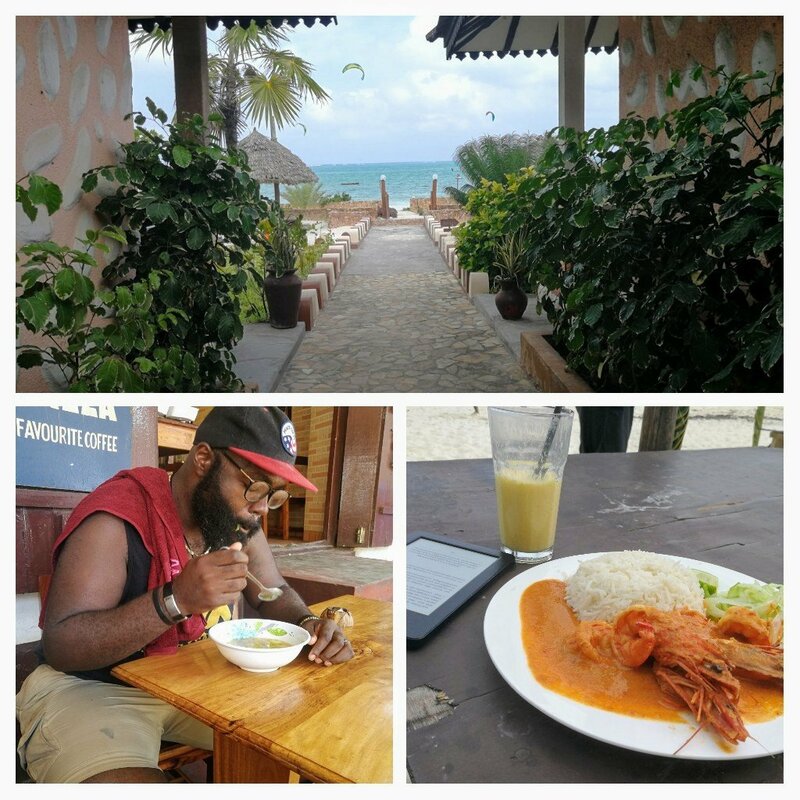 The above pictures are (top) the walkway to the beach, (bottom right) red curry prawns with a mango smoothie-and a view, and (bottom left) me eating a traditional Zanzibari soup.